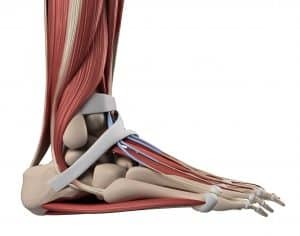 –Tendons are tough, ropelike soft tissue structures which connect your muscles to your bones. Along with muscles and ligaments, they’re a critical component of your musculoskeletal system. Without tendons, you literally wouldn’t be able to move. The large tendon which connects your heel to your calf muscles, the Achilles tendon, is a common site of injury. Tendon injury also occurs relatively frequently to the medial (inside) and lateral (outside) tendons of the ankle. For detailed descriptions of these injuries, search the terms Achilles Tendonitis, ankle sprain and sports injuries. This overview deals with less severe injuries, not full tears or ruptures. This type of injury is by far the most common type of tendon injury, affecting millions of people each year in America and around the world. These are extremely common sports injuries, yet can happen to anyone. A tendon injury is possible anywhere a muscle inserts into a bone, and commonly occur near a joint. The shoulders, knees, elbows, and ankles are especially vulnerable, and the bulk of tendon injuries occur in these areas. 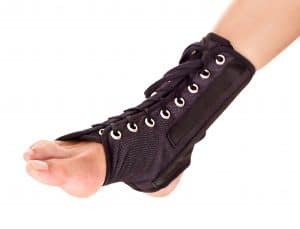 This type of non-tear injury doesn’t happen suddenly, and is instead usually the result of chronic micro-trauma, also known as “wear and tear.” By and large, these are overuse injuries. Tendinitis: this term is used to describe chronic inflammation of a tendon. Tendinosis: This term describes micro-trauma in the form of many tiny tears throughout the length of the tendon. Tendinopathy: A general term which simply means a medical condition affecting a tendon. In a clinical setting, doctors tend to use the term “tendonitis” to describe many types of tendon injuries. Today, the terms “tendinosis” and the more general “tendinopathy” are rarely used by non-specialist physicians. In cases of sudden tendon injury, it is highly likely that the injured tendon was being gradually weakened over time. In this vulnerable state, a major tendon injury can occur much more easily. Pain tends to worsen with active movement (muscle contraction moving a joint). There is less pain when the joint is being moved by someone else, for example a doctor examining the injured joint. Pain and stiffness is usually worse in the morning until the patient “warms up.” Symptoms also tend to worsen at night, after the patient has been using the joint throughout the day. There is usually visible swelling and inflammation. The area may be tender and warm to the touch. A crunchy sound and a grinding feeling is common when using the joint which the tendon crosses. In many ways, the symptoms of a tendon injury are similar to those of bursitis. A physical examination by a trained healthcare professional is usually needed to tell them apart. Imaging tests such as CT scans and MRIs are also useful. provide the information needed for a diagnosis. If there’s any doubt, or if your symptoms don’t improve with time and conservative treatment, further exams are needed. This usually includes some type of imaging, whether it be an X-Ray exam, CT scan, or MRI. In most cases, imaging exams aren’t necessary to diagnose a tendon injury. Instead, the diagnosis is made based on the patient’s history and physical exam. Orthopedic tests, in which the doctor stresses the suspected tendon, can be very useful (and are often more accurate than imaging studies). While things like observing range of motion and testing muscle strength aren’t technically orthopedic tests, they’re very useful nonetheless. X-ray studies. These can’t visualize tendons and other soft tissue structures well, but are very good at identifying calcium deposits. This is often enough to reach a diagnosis. They’re also inexpensive, which makes them a good place to start when diagnosing musculoskeletal injuries. Ultrasound exams. 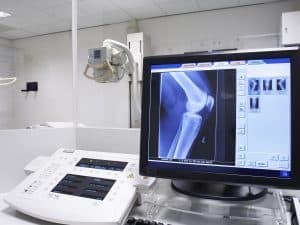 While ultrasound can’t penetrate bones, it’s capable of showing small tears within ligaments and tendons. Unlike X-ray exams, ultrasound is completely safe since it doesn’t involve radiation. It’s also a very cost effective option. MRI (magnetic resonance imaging) exams. MRI is the standard by which all other imaging exams are judged. They can visualize all types of tissues, including tendons, ligaments, muscles, bones, and organs. The level of detail achievable with MRI is unmatched. At this time, MRI studies are very expensive. Initial treatment for tendinopathy, the catchall term for tendon injuries, is fairly straightforward. This typically involves relative rest, e.g. “taking it easy,” and over the counter pain medications. NSAIDs (Non-Steroidal Anti-Inflammatory Drugs) such as Motrin and Aleve are recommended to reduce swelling. Gentle, non-weight bearing range of motion exercises are also a good idea.